America loves juicy, tender, slow-smoked ribs. From the backyard griller to the seasoned BBQ pro, everyone has their secret recipe for the best ribs on the block. So what could be better than tossing a slab on the smoke and enjoying the fruits of the barbecue? How about wrapping those ribs in delicious, smoky bacon! My recipe for Smoked Bacon-Wrapped ribs is more of a method to perfecting these hand-held delights, rather than a step-by-step instruction manual for porky goodness. I prefer to use the meaty spare rib for this method, although Baby Back ribs will work just as well. To perfect bacon-wrapped ribs, let’s start with the basics. All racks of ribs come with a silvery membrane on the back side of the ribs. This membrane, called a pleura, needs to be removed to promote rendering of the fat underneath it and promote the flavors of rubs (and bacon) to penetrate into the meat. To remove the membrane, work it away from the meat with a butter knife or spoon, then grab it with a paper towel and pull it away. With the membrane removed, fully slice the ribs between the bones to make individual ribs. A rack of spares will usually yield about 12-14 full size ribs. The smaller ribs made of cartilage and the trimmings from alongside the rack, called the rib tips, can be reserved for bite-size snacking or utilized for other purposes. With the membrane removed, rub the individual ribs with Croix Valley All Meat BBQ Dry Rub (or any Croix Valley rub) and place in a foil pan. Place the ribs on a 275°F smoker or on a grill over indirect heat. Cook the ribs for 2 hours in the pan, then remove to wrap with bacon. To finish the process, each rib gets wrapped in a dressing of bacon. Thick-sliced bacon does not work as well for wrapping, so be sure to choose your favorite thin-sliced variety. Depending upon the size of the rib, two slices may be required to fully wrap the ribs. Once wrapped, sprinkle the bacon with additional dry rub and place back in the pan, tightly nestled together so that the bacon will form to the rib as it cooks and shrinks and prevent the need to tuck the ends of the bacon underneath itself. Place the ribs back on the smoker or grill for an additional 2 hours, at which point the bacon should be fully cooked and slightly crisp. Remove ribs from pan and place directly on grill grates or a grilling screen to allow the sides of the bacon-wrapped ribs to firm up in the heat and ready for sauce. After about 10 minutes in the dry heat, baste the ribs with Croix Valley Sweet ‘n Smokey Competition Barbecue Sauce (or your favorite BBQ sauce), allowing an additional 10-15 minutes in the smoker for the sauce to set. Remove the ribs from the smoker and let your guests enjoy. These individually-wrapped ribs take the backyard BBQ to a different level of genius that will have the neighborhood begging the grill master to replicate the magic at every event! 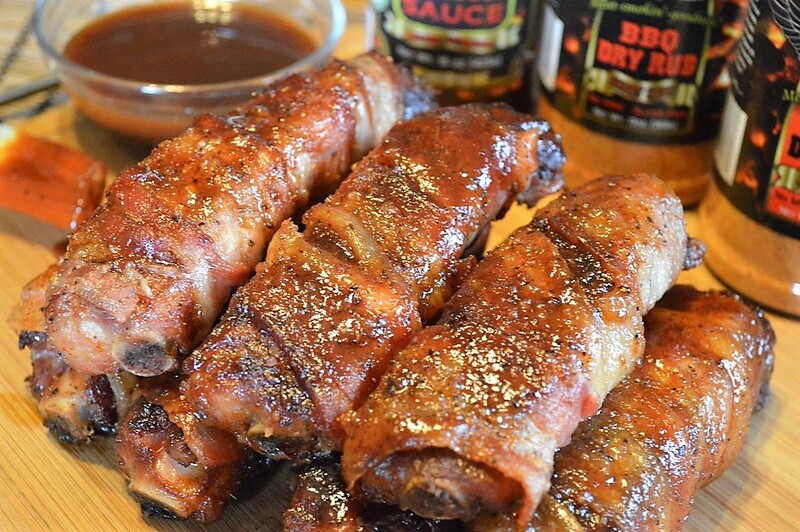 Check out these killer Croix Valley Bacon-Wrapped BBQ Ribs. So easy to make and wicked delicious!